As I pulled into Alpental's Lot # 2 to join a grand total of 3 other vehicles, I suddenly remembered that the ski area was on the "slow Spring death" schedule and only running the lifts from Thursday through Sunday . . . meaning that Kevin, Frank and I needed to skin if we wanted to ski. No problem, Kevin was ready for the heaviest of mank with his new crud-busting Verdict + Freeride setup and factory-cut skins (which as it turned out, weren't any too wide for the conditions on the Phantom). 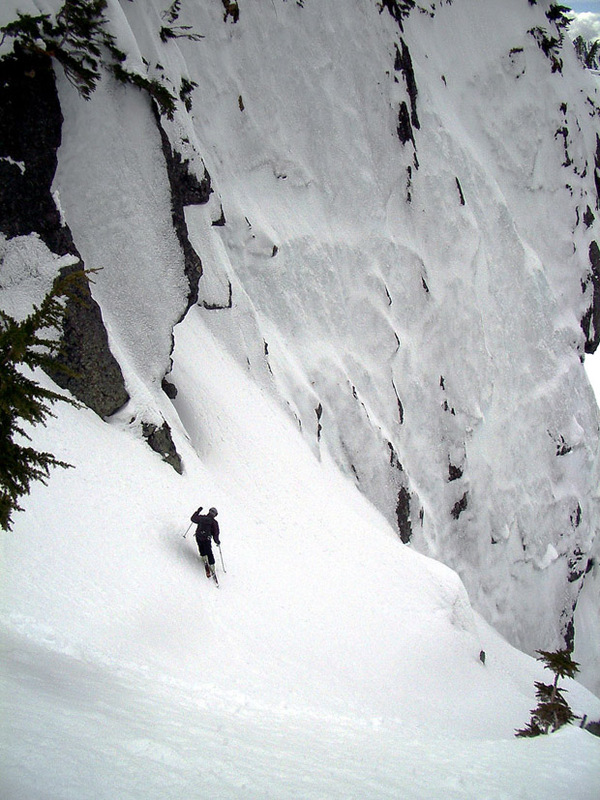 We decided Snoqualmie Mountain's Crooked Couloir might be worth a shot, and hit the trail. We took the scenic route around the waterfall instead of climbing straight up in the trees (actually way scenic; Kevin insisted on an extra long traverse in the direction of Snow Lake for some reason), skinning through variable corn mush in the trees in warm spring-like weather. 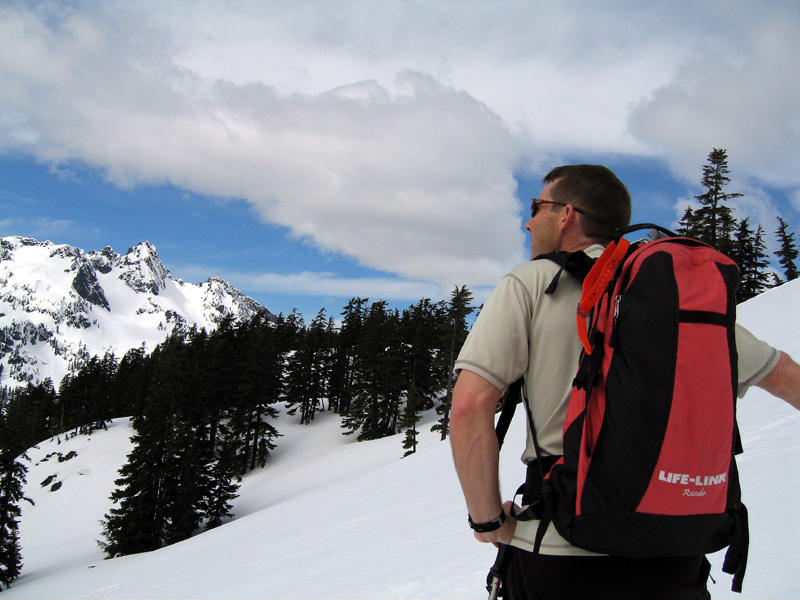 Closer to the top, the underlayer had frozen during the past two nights, and traction got a little worse, but there was still no call for the ski crampons that I had actually remembered to put in my pack; a little side stomp to each step did the trick. I started looking for the top when my watch said 6,212 ft. and promptly it came into view. 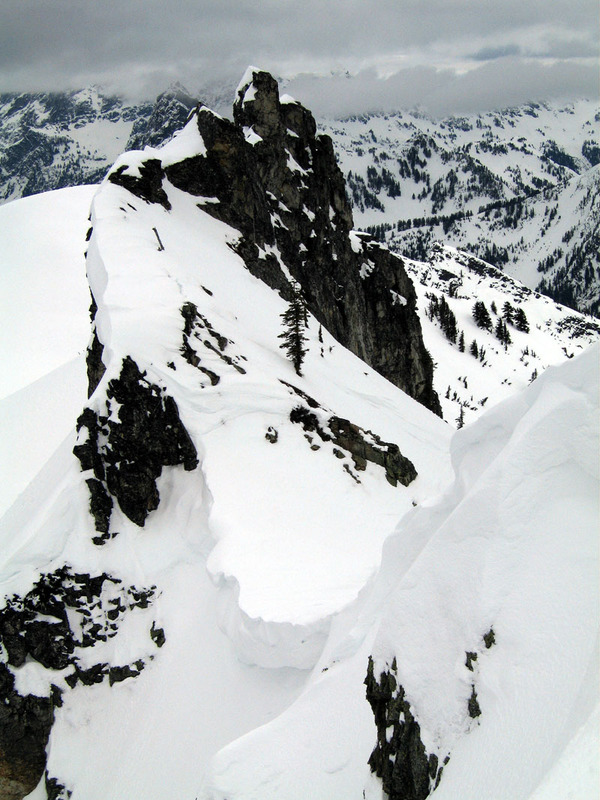 A nice looking ridge defines the summit ridge of Snoqualmie Mt., with several potential drop-in points via rather massive cornices this year. We hemmed and hawed, had a sandwich or two, and finally decided on the one from the very top, which looked to have about an 8 foot drop into the bowl. The huck proved to be uneventful, but unfortunately the snow quality left a bit to be desired - it had apparently rained on the top and frozen a couple of times, making big GS turns the order of the day, but the ambiance was unparalleled. 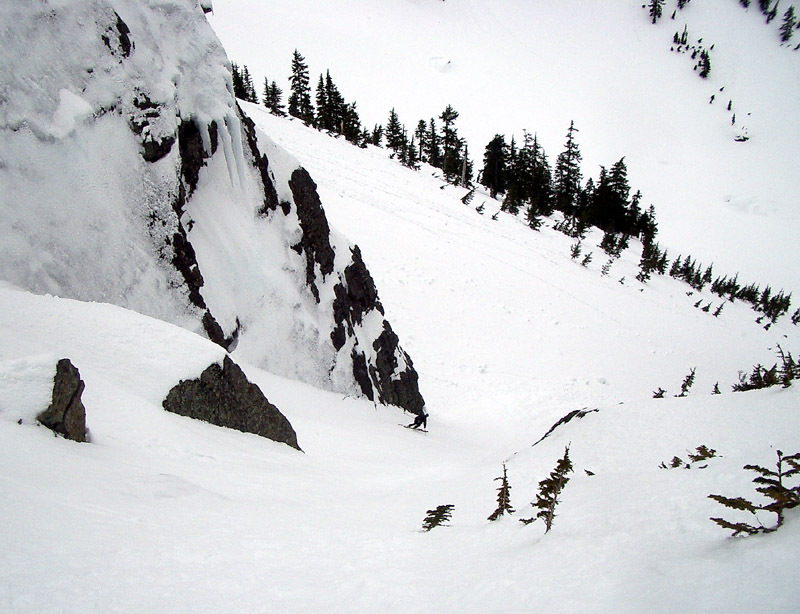 We skied over the hump after the initial bowl and continued down in the narrow part of the couloir. The bottom turned out to be a piece of cake this year - the narrow portion with the rock impediments is almost completely filled in, with the narrowest point being at least 10 feet wide. Partially frozen avy debris put a slight damper on our enthusiasm as we exited onto the wide open junction with the Slot Couloir, which looked to be heavily pitted with pinwheel tracks. 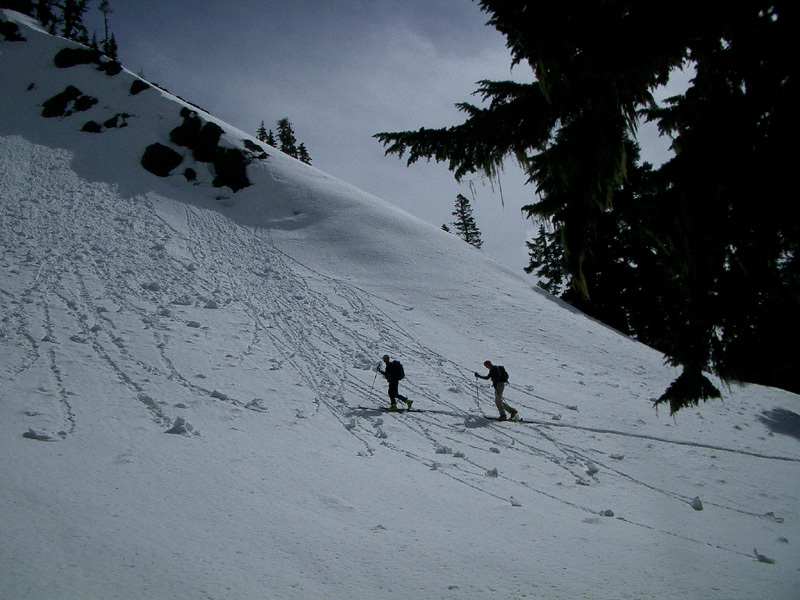 We traversed as high as possible, then skinned the entire way to the NW shoulder (no booting this time). The ski down the Phantom? Think thick corn gruel. About 2 feet deep. And VERY slow . 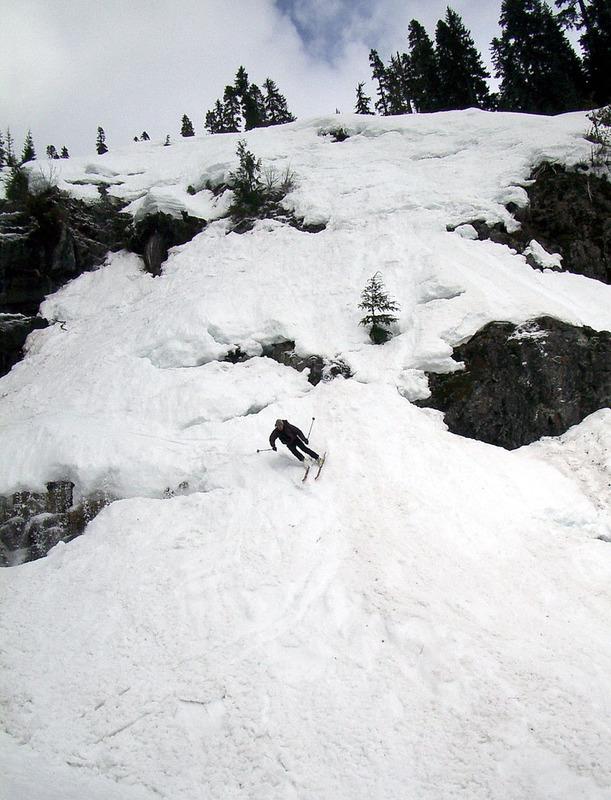 . . We managed to set off several largish slides on the way down, and used numerous ski cuts to move the top layer of mush on the waterfall. 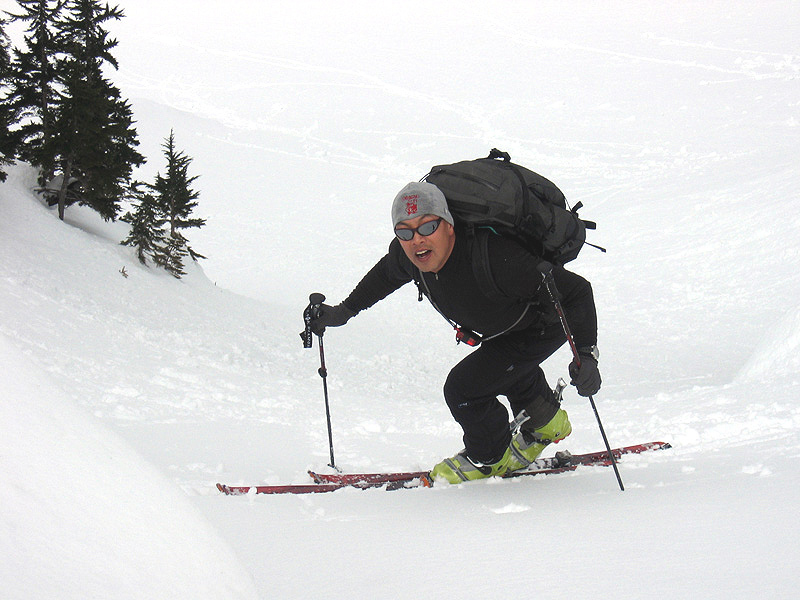 Rotten snow and the very audible sound of running water under our skis gave us reason to question the wisdom of staying out on the Phantom, but in the end we managed it safely with some speed and strategic hopping . . .